I've always enjoyed lighting fires. Not arson, I hasten to add - there's just something satisfying in laying up a fire and then seeing it gradually take light. Growing up I had plenty of practice in fire-lighting, as we had a big open fireplace in our lounge which would often be lit on winter evenings. I have fond memories of sitting cross legged in the lounge folding sheets of newspaper into zig-zag concertinas on to which I'd then place kindling and small logs before lighting. The secret, I found, was to set fire to the newspaper in as many places as possible, as this gave the kindling the best chance of taking light, and therefore the fire the best chance of getting going. I learnt my lesson about trying to get a fire going with not enough kindling, or with logs that were too large or too wet. In truth, there's definitely an art to getting a fire burning well. "I've always enjoyed lighting fires. Not arson, I hasten to add..."
Like any good recipe, you need a few key ingredients for a decent fire. 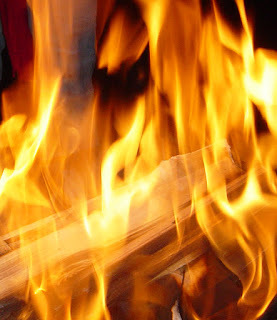 The classic "fire triangle" is fuel, heat and oxygen. Without any one of these your fire will struggle, and I've learnt my lesson on each ingredient. In the past I've smothered fires with too much fuel, not allowing enough oxygen, and just ended up with a meekly smoking pile. Alternatively I've not used enough newspaper or kindling to spread the heat. I've used wet wood which just dribbles and smokes, leaving me red-eyed! I'd add to these three requirements that you also need suitable preparation - you need to lay it up first - and patience, as a blazing fire doesn't happen in an instant. The reason I'm saying all this is that whatever your side-hustle may be, whatever your passion or craft, I think it's a lot like lighting a fire. Skills aren't acquired overnight and our ambitions or dreams rarely blaze into being fully-formed. Instead we need to start small, lay up some suitably sized kindling that we know will take light, before adding larger or more complex elements to it. "...whatever your passion or craft, I think it's a lot like lighting a fire..."
I began to think about this comparison a few weeks ago. We'd been tidying our garden, and I'd been sorting through my wood stack - I tend to collect useful pieces of scrap wood for my various making projects, but along the way I'd also acquired plenty of not so useful pieces. So having taking a big load of old chipboard to the tip, I was left with a pile of scrap wood to burn in our fire-pit. The Jubilee beacon... took a while to light! My children were desperate to toast marshmallows, and were most disappointed to learn the lesson first hand that fires take a while to light! Even at public displays it can take longer than planned for a fire to get going. For the Queen's Jubilee a few years ago a big beacon was to be lit on a nearby hill to us. We went and looked at it in the day and it was just a big pile of brush and branches (or at least that's all we could see, maybe it was laid up better underneath). Unsurprisingly that evening it took a long time to light, by all accounts. We were watching from our upstairs windows in our house, and thought we just couldn't see it when the appointed time came (cue disappointment all round). However, by an hour or two later we could finally see it as the blaze eventually got going. "What lessons can we apply to our passions and projects from lighting fires?" 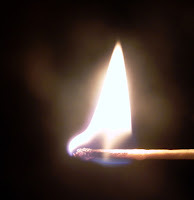 So what lessons can we apply to our passions and projects from lighting fires? Well, in the first instance don't try and do too much too soon - overloading a fire smothers it. Don't put all your firewood on in one go - pace yourself! Perhaps you need to split your logs into smaller chunks? If your goal seems too big and overwhelming, can you 'chunk' it down into smaller sections which might 'burn' more easily? Secondly do allow enough space for your fire to grow. Actual fires need oxygen to circulate, to fan the flames - so can you get your dream out into the open? Is there a way you can create a vent for your work? Perhaps this might be about going along to an open-mic night if you're a musician, or exhibiting your art somewhere, or submitting poems... whatever your passion how can you go public to give it room to breathe and fan the flames further? Light several places at once..
Thirdly, perhaps you haven't got enough heat! I think this is about working to deadlines - is there some way you can apply some extra heat in that way? This could be linked to going public - or committing to a regular routine (for instance my promise to you is that I'll write a new blog post each week). How can you heat things up? "Is there a way you can create a vent for your work?" Thanks for taking the time to read Starting Fires. If you've enjoyed it please share it with your friends on social media! Why not subscribe to The Potting Shed Podcast on iTunes or Stitcher for expanded musings and much more (direct RSS feed is here).